The BJP leader's remarks came soon after the Telugu Desam Party (TDP) announced its exit from Prime Minister Narendra Modi's coalition over the centre's refusal to grant special status category to Andhra Pradesh. New Delhi: The BJP on Friday said the exit of Chandrababu Naidu's Telugu Desam Party (TDP) from the National Democratic Alliance (NDA) was "inevitable after its mischievous propaganda against the Centre" and added that it presented "a timely opportunity" for the party to grow in Andhra Pradesh. "People of Andhra Pradesh have now realised that the Telugu Desam Party is resorting to lies to cover up its inept and inert governance. Far from being a threat, TDP's exit is a timely opportunity for the BJP to grow in Andhra Pradesh," Mr Rao added. 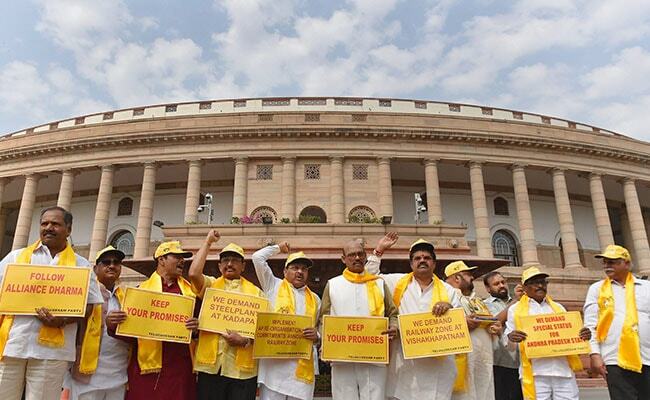 The TDP has also moved a no-confidence motion against the Centre in Lok Sabha. The TDP-BJP four-year-old alliance soured quickly after the budget, with Mr Naidu complaining that Andhra Pradesh had been severely neglected. The Andhra Chief Minister said he when he called, the PM did not come on the line. He also described as "hurtful and insulting" Finance Minister Arun Jaitley's comments as he explained why the Centre cannot give Andhra Pradesh "special category status." Arun Jaitley had said that the Centre was happy to give funds to Andhra Pradesh, but cannot give it special status as that scheme was scrapped by the 14th Finance Commission for all states except the north east and hill states. The BJP also withdrew its ministers from the Andhra Pradesh government.